The 2ft Radius Corner pool, with its classical lines and elegant rectangular shape, is a tribute to the art of fine living and will invite you to endless hours of free spirited swimming, luxurious sunbathing, and sumptuous entertaining. 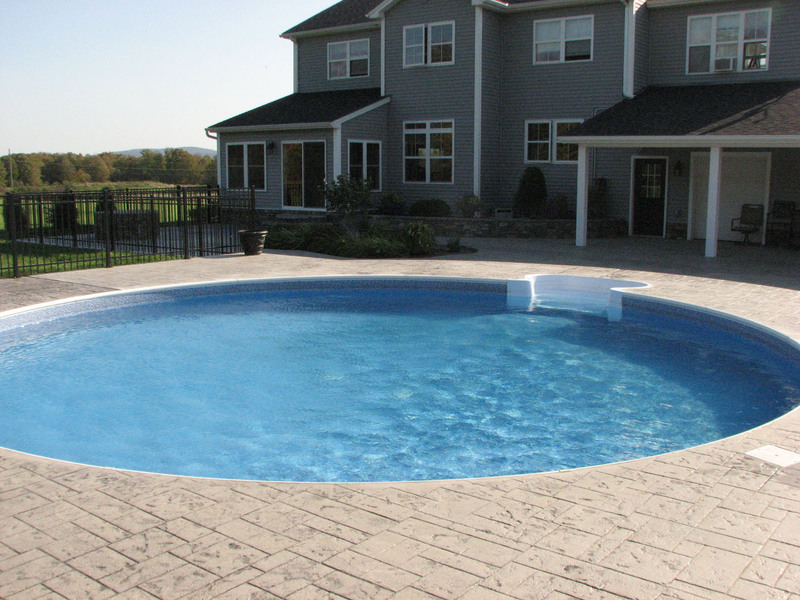 This pool features 2 ft. Radius corners and is the only pool with our walk-in stairs triple option widths. Traditional 6 or 8-foot wide stairs are available, as well as extra wide 12-foot built-in stairs located at the center position for lounging. 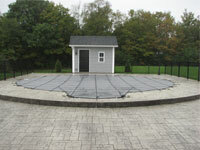 Create your own resort right in your own backyard with a Legacy 4 ft. Radius Rectangle. 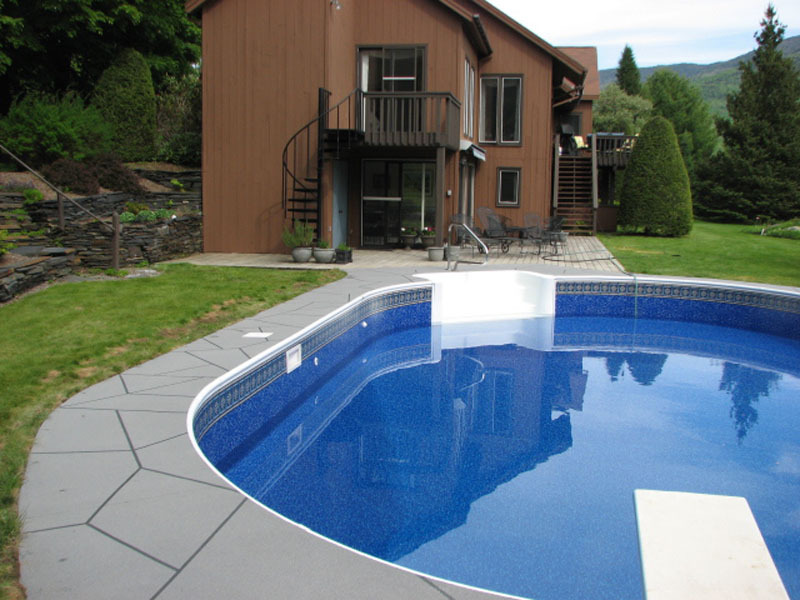 A masterpiece of contemporary design, this pool has graceful lines that fit into any landscape design. Its distinctive large radius corners give it a flowing elegance that rivals pools found at the finest private resorts. But you can have it right in your own backyard. You may select optional 8-foot wide walk in stairs. If you can dream it, we can build it! Yes, we have a wide selection of shapes, but sometimes you want or need a shape thats really different. A pool that is completely customized to your particular corner of the world. Just let your Certified Legacy Edition Pools Builder know. They love a challenge. Because of our modular configurations, sophisticated production capabilities and integrated systems, we can design and build almost any shape you want. In fact we thrive on challenge and love the opportunity to bring our expert capabilities to new design problems. 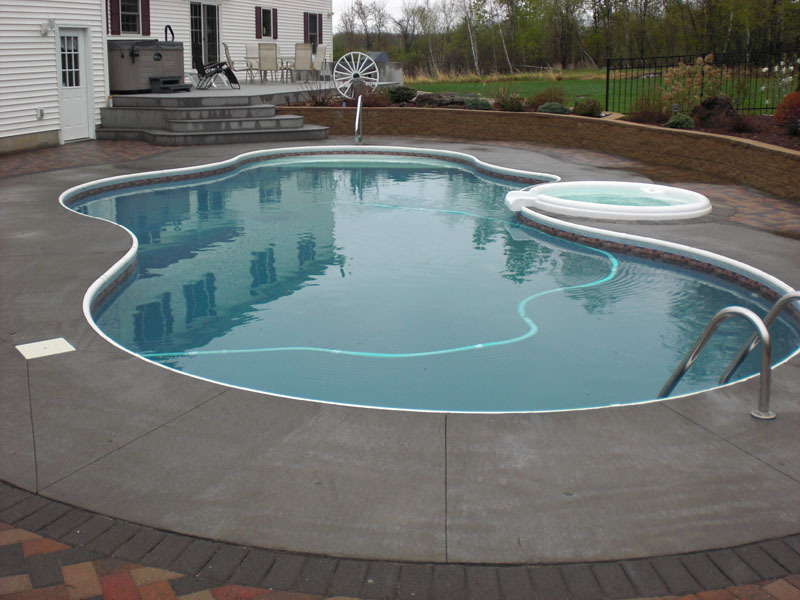 Whether you want a lap pool to help you stay in shape , or a free flowing design that conforms to a difficult landscape, our Certified Builders can give you exactly what you want. Pretend youre in the Mediterranean. The cloudless blue sky overhead. Inviting water at your side. The stunning shape of the Grecian series will fulfill all your poolside fantasies. Fluid lines beveled corners highlight the Grecians contemporary design and suggest a luxurious installation with all the amenities of the good life. Due to its favorable design, Walk-in stair location is easily in triple option for both 6 or 8-foot widths. With its distinctive shape, the elegant Jewel series will add royalty to any home. A true gem of a design, the Jewel has commodious proportions, georgeous enough to encourage even the most active swimmers. Our optional 8 foot wide stairway adds convenience and safety. Round for the shallow end where playing is constant fun and rectangle for the deep end where more serious swimming is essential. Its a perfect fit for all types. A rare combination of nouveau surround unite with classic lines to form this most unique shape. Its aesthetic artistry is backed up by engineering excelence, for its unitized panel construction gives an exact matching radius to each section. Choose between 14-foot wide inside radius stairs or one piece wide 8 radius Step-N-Rest. With its deeply scalloped bays and coves, create your own personal Caribbean coastline and get away everyday. The free-form Lagoon transports you to an exotic tropical vacation right in your own backyard. Formerly a popular custom pool, this now standard shape lets you transform your home into a beautiful waterfront property. Imagine yourself in Switzerland. Or high in the Adirondacks. With the mountain Lake series you can transcend the limitations of your own terrain and create a lakeside retreat. You can specify the Mountain Lake series in a range of sizes and design its contours to echo the curves of your landscape. With its superb engineering, unparalleled construction, and natural look, the Mountain Lake pool will give you the pleasure of a lifetime. As well as specifying a size, you can specify options like inside radius 12-foot built-in stairs or 8-foot radius one-piece Step-N-Rest. The appealing in design Mountain Pond features the same curvaceous shape as the Mountain Lake except radii on each end of the pool is symmetrical. 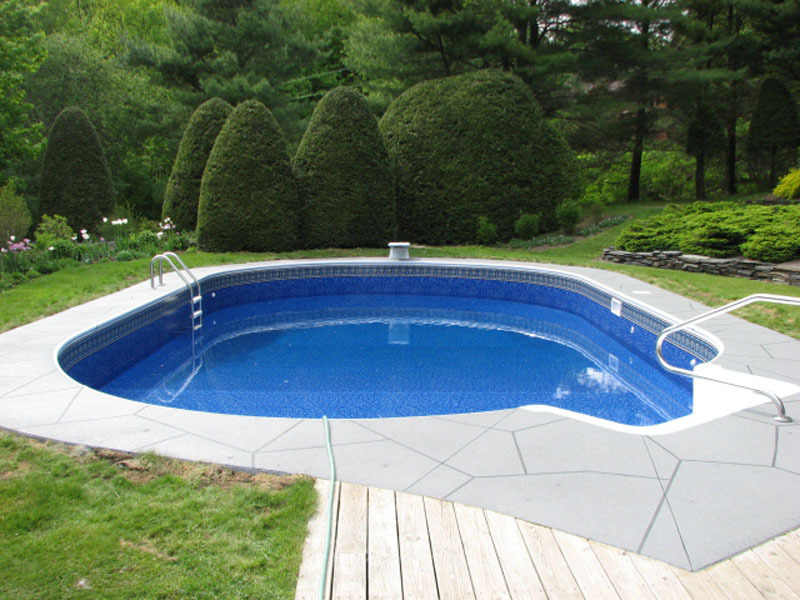 Each equal end radius increases as the width of the pool becomes larger. The 7′ radius is standard on the smaller size, 8′ radius on the middle size, 9’radius on the large and 10′ radius for the largest size. For perfect balance to your yard, choose the pleasing graceful look of this series. Its well-proportioned shape will add harmony to your landscape and deck surround. Unitized radius panels, coupled with 2.35 ounce galvanized steel, make its construction formidable and durable. Optional 8-foot wide one- piece Step-N-Rest provide safe and easy entry. No backyard is too small for a Legacy Pool. 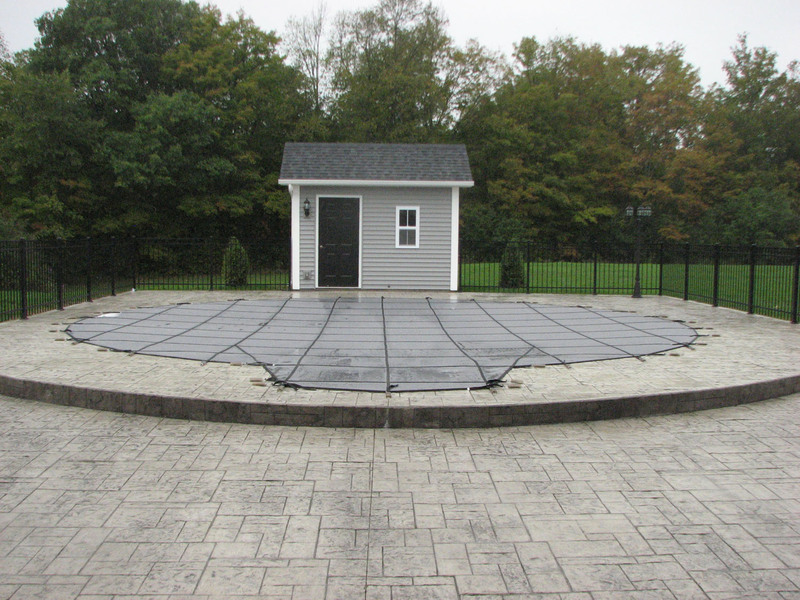 Our Patio series features an octagon design that conforms easily to small or odd-shaped spaces. Available in two sizes, the Patio pool is large enough to provide plenty of room for fun and swimming, and comes with a variety of attractive bottom designs. An 8-foot optional stairway provides easy entrance and exit. With its compact size, you can tuck the Patio in almost any corner of your property for a summertime getaway. From coast to coast, America is built on steel. The Brooklyn Bridge…The Sears Tower…The Golden Gate Bridge. Each stands as an enduring legacy to American engineering and ingenuity. Unapologetically tough, yet timelessly elegant in design, these steel structures were built to last. This same strength is reflected in every Legacy Edition Pool. 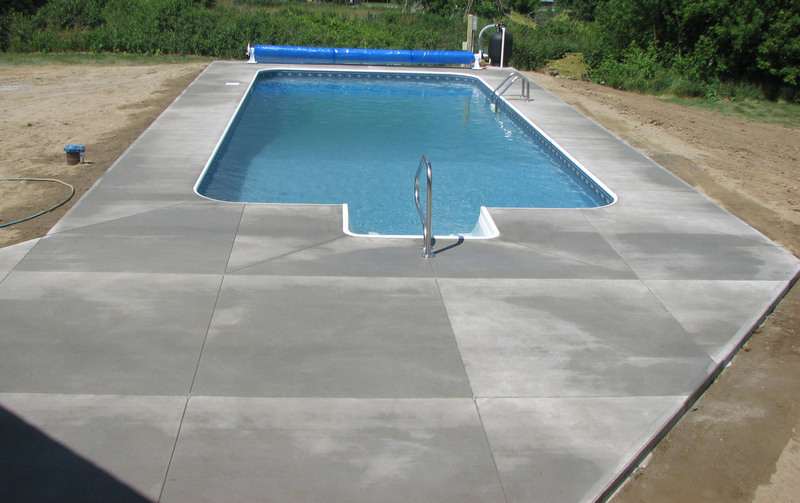 Legacy pools are constructed using the highest quality, zinc-coated, galvanized steel available. The walls of your Legacy pool contain 200% more zinc per square foot than commercial grades—providing an impenetrable barrier against corrosion. A Legacy of Engineering and Ingenuity. STRONG WALLS REQUIRE A STRONG BACKBONE. 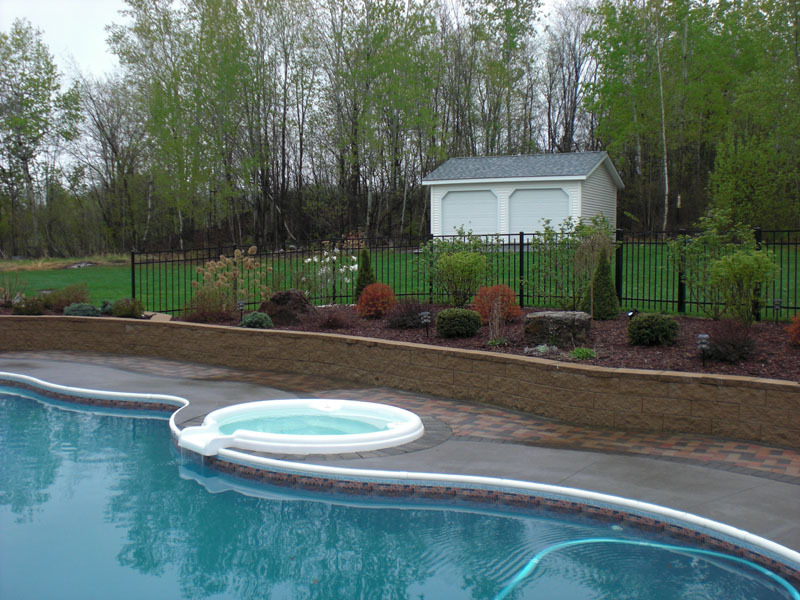 The strongest steel braces in the industry provide uncompromising support to Legacy’s pool walls. Our A-frame steel braces are 2″ x 2″ x 1/8″ thick angle steel. Legacy pools are designed to withstand the harshest weather conditions that Mother Nature can dish out. 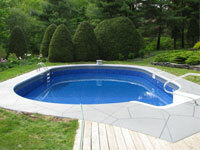 Winter freezes and spring thaws cause concrete, gunite and fiberglass pools to crack and shift over time. Once a concrete or fiberglass wall starts to crack, there’s no foolproof—or cheap—way to fix it. 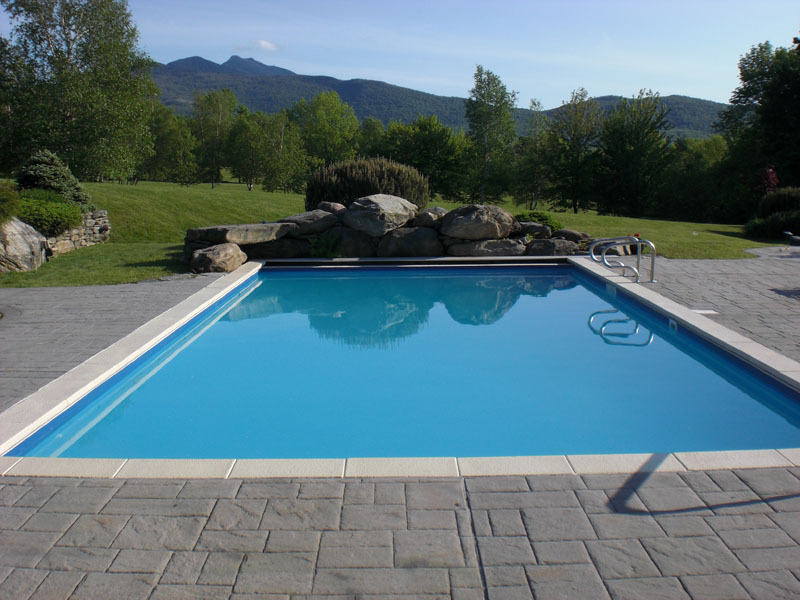 Legacy pools are engineered for durability and strength to withstand extreme ground conditions. The true uniqueness of a Legacy Edition Pool lies in the triple bend design of our steel panels. IT’S SIMPLE: THE MORE BENDS IN A STEEL PANEL, THE STRONGER THE WALL. 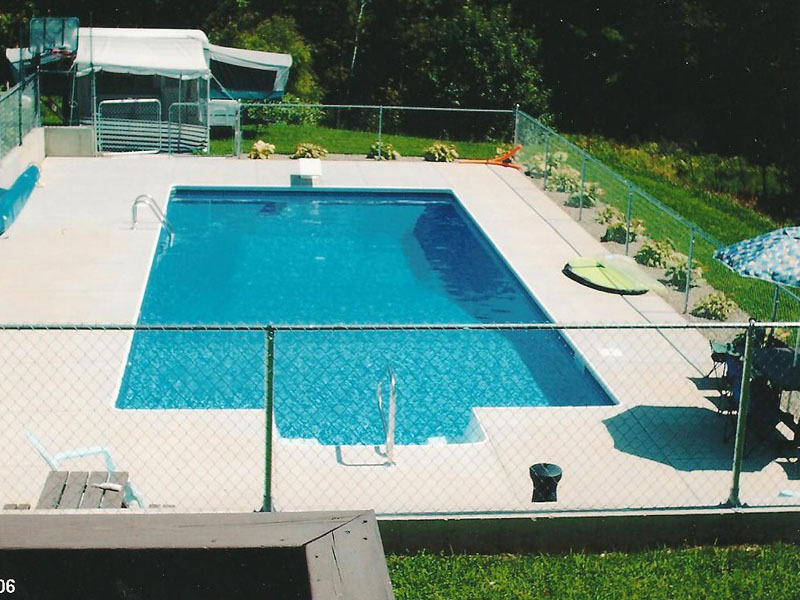 The average steel pool offers only double bend panels. Legacy’s triple bend design provides 33% more strength than it’s double bend counterparts. The top and bottom flanges of Legacy’s steel panels measure over a half a foot (7 inches in total) in thickness. Couple that with Legacy’s distinctive bolt inter-loc system that further strengthens the side flanges of our steel panels. Also for extra support, the 8′ panel features full flange dual stiffeners made with triple bends. Steel: Its super structural strength is required to build bridges and erect towering buildings. 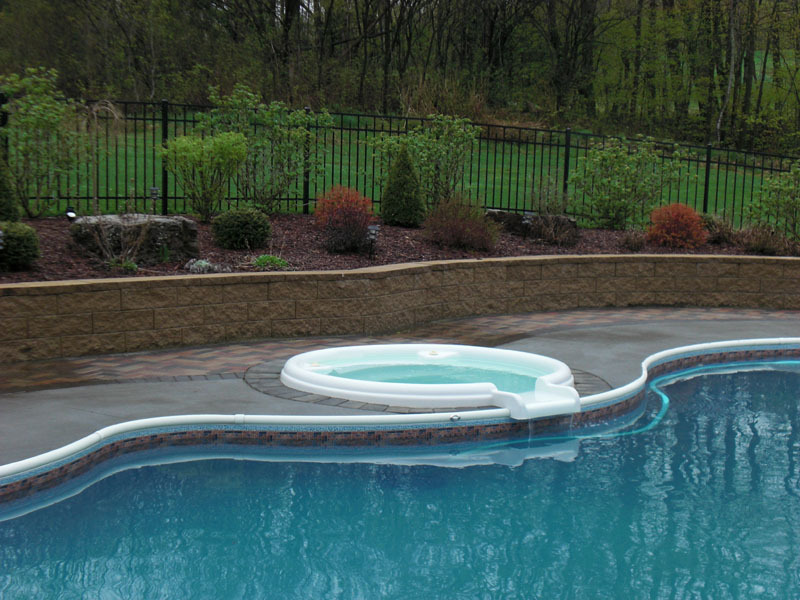 The structure of an inground swimming pool demands solid support too. Thats why all Imperial Legacy Edition Pools feature sturdy steel frame construction. The inherent qualities of steel withstand extreme external pressures and are capable of containing tons of water without buckling under the stress or strain. 50 years of experience developing and refining steel applications have made Imperial Pools a leader in the industry. The superior strength and quality of our workmanship upholds our commitment to excellence. As proof of our commitment to design and fabrication excellence, every Imperial Legacy Edition Pool comes with a limited LIFETIME WARRANTY with a one-time transferable provision. The steel walls of your Imperial Legacy Edition pool are guaranteed for life against any defect in material. This assures you protection against damage due to rust, corrosion, or material defects. An Imperial Legacy Edition Pool of steel is built to last a lifetime guaranteed! The 8 Built-In Stair can be added to any Legacy Pool. It works exceptionaly well on Rectangular pools as a well defined entry/exit point. Built in Stairs work seamlessly in your new Legacy pool. 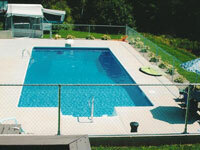 Because they are part of the Steel structure of your pool you cannot tell where the pools ends and the stair begins. Available on all Rectangular Pools the Corner Built-In Stair maintains the outer shape of your pool while taking up less swimming area in the shallow end of your Legacy Pool. 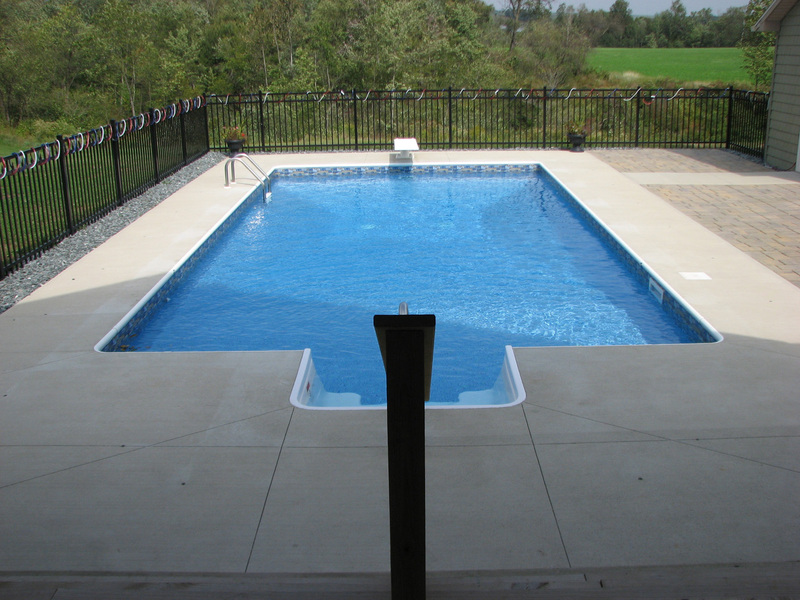 The Full End Radius Stair with Sundeck option is a truely unique feature for your Legacy Edition Pool. The Sundeck is perfect for sunbathers to tan while staying cool, as well as a play area for small childern. The Full End Radius Built-In Stair is designed for use in all radius shallow end pools. This step works perfectly in the Lagoon, Mountain Lake, Kidney, Keyhole, and Roman End. The Full End Straight Stair is designed to fit in all Rectangular pools. The Full end Step gives superior functionality to a classic design. The Interior Wedding Cake Stair can be added to any shape giving you a clean flowing lines without disturbing the shape of your pool walls and gives you a truely unique look. 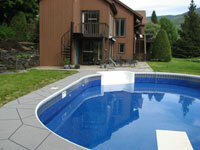 The Legacy Tread-Loc Step is the highest quality pool step available to the industry. We start with a thermoplastic sheet material of ABS with a pure white cap, Luran® S from BASF, to form a one piece integral step. This material is designed to have excellent weather-ability and chemical stability as well as resistance level to acids, alkalies, and salts. Luran® S is also specially formulated with ultraviolet inhibitors to ensure long-term durability.